Coleraine boss Oran Kearney. Picture by Stephen Hamilton / Press Eye. Coleraine fans are anxiously waiting to find out where they will heading to at the end of the month as the make their return to European football. It’s 13 years since the Bannsiders last took on European opposition when they faced Portuguese side UD Leiria. Come noon today though they - along with fellow local Europa League qualifiers Ballymena United, Crusaders and Derry City - will be preparing for another European adventure. The quartet could find themselves paired with some household names from the seeded part of the first qualifying round draw. Coleraine boss Oran Kearney though is relishing the task facing his side, no mattet who they draw. “It’s fantastic to be involved in the draw,” said Kearney following his side’s win over Bangor City on Saturday. “People have asked me who do you want to play against, but for me we can’t lose no matter who we draw. “I’ve gone to some far out places when I was a player and it was brilliant, you still talk about those trips, and it really builds the team spirit. “The boys will have a ball and it will be a great experience. “Being selfish probably drawing someone with a low coefficient so you have a real chance to getting through would be the ideal scenario. “People talk about Rangers, and yes it’s probably the one you would take, but after that a low ranked team is probably what we would be looking for. “The draw will be a real mixed bag as there are teams there who could put some serious goals past you, but there are also a number of teams you would have a great chance against. It’s another big learning step for the boys. Linfield will also find out their European fate today as the Champions League qualifying draw takes place at 11am. The Blues make their return to the competition following a four-year absence. And they warmed up for the new campaign with a 3-1 win over Welsh side Bala Town on Saturday. 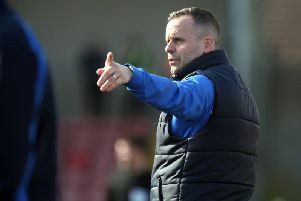 “It is important for us to have good games in pre-season because we want good preparation and to go into the season ready,” Healy told the club website. “The players have come back fitter and stronger and I hope that will stand us in good stead. “Trips away like this give the boys a good idea of the preparation needed for Europe. “The travelling, the meal times, the preparation when we get to the ground, all these things are so important. “It gives us a heads up about what lies ahead for us over the next couple of weeks. We have a great group of players here and they finished the season strongly last season. “You go away for the summer but when you come back you always want to be successful again, you hope the players come back with the same hunger to carry on.